Tripoli Bakery’s biggest claim to fame: “beach” pizza. 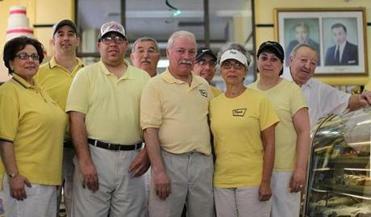 Right (from left): Leonora Zappala Mambro, Matthew, Stephen, and Rosario Zappala, Dominic Criofolo, Andrew Zappala, Marie Zappala Stewart, Lucille Dadducci, and Steve Zappala. 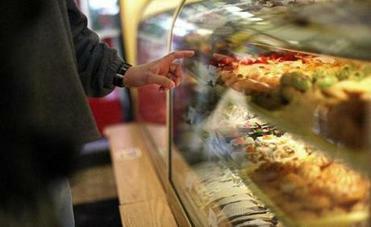 LAWRENCE — It takes no imagination at all to picture Tripoli Bakery as it was almost 60 years ago. That’s when this Lawrence fixture — which now has locations in North Andover, Salisbury, Seabrook, and, this month, Methuen — was last renovated. From the giant freestanding yellow sign bearing the bakery’s name in swooping script to the vast pastry-filled glass-fronted cases inside, the place is a perfect period piece. It could be some hipster’s retro vision of an old-fashioned bakery, but one thing Tripoli does not sell is irony. Almost everything else, it seems, is on offer inside that great big case of temptations: cupcakes, Italian cookies of every kind, cream puffs, flan, eclairs, whoopie pies, Napoleons, cream horns, lobster tails, elephant ears, you name it. Behind the counter, breads are stacked high in their display area: scali, Vienna loaves, Italian sticks — nothing with figs or olives or flaxseed. And that’s all in addition to what might be Tripoli’s biggest claim to fame: “beach” pizza. Square, slightly sweet, often imitated but never duplicated, the pizza brings in the faithful from miles around. Regulars long for a fix of this unusual and deceptively simple pie. 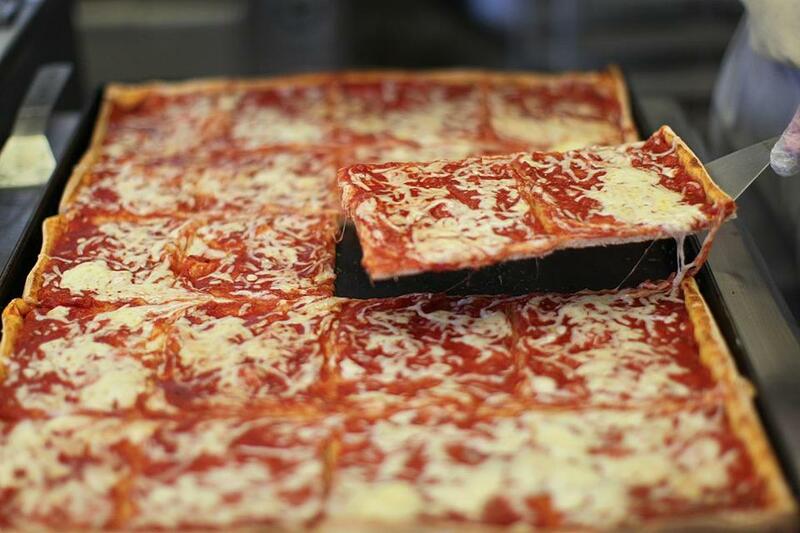 The two-slice boxes are stacked and ready for slices of the pizza that has only added to the bakery’s popularity. Although the pizza’s history goes back to the postwar period, the bakery’s roots extend much further. Tripoli Bakery practically defines the term “family business.” It was founded in 1913, in what was then a predominantly Italian neighborhood in Lawrence. In 1924, it was purchased from the original owner by Rosario Zappala, an immigrant from Sicily; today, it’s run by the third and fourth generations of Zappalas. The bakery is a full employment plan for the family. On a recent Wednesday morning, about 12 members were at work, filling boxes behind the counter, perfecting loaves in the kitchen, spreading sauce over panfuls of crust in the pizza area. The Zappalas have sold baked goods at Tripoli since 1924. A steady stream of customers attests to Tripoli’s large and loyal fan base. Eulalio Veras, who says he went to school with Matthew Zappala, was picking up five bags of frozen pizza for an upcoming trip to visit family members in Florida; he didn’t dare show up without bringing everyone’s favorite pie. The bags each contain five large rectangular frozen slices and seem to fly out the door almost as quickly as fresh, hot pies. Veras is hard-pressed to single out what makes Tripoli’s pizza so special. “My brother says it’s the sauce, my niece says it’s the cheese, and some say it’s the pizza dough,” says Veras, who travels from Marlborough at least two times a week for Tripoli’s pizza. “It’s one of a kind,” adds his companion, Yoko Tanaka. About that sauce: Partisans invariably describe it as “sweet,” which might seem a bit off-putting; sweet sauce sounds like it belongs on ice cream, not pizza. But the sweetness is subtle, and the taste of oregano keeps it within the realm of pizza possibilities. Somehow, atop the cracker-crisp crust and under a small handful of cheese, it just seems right. If you like your pizza ooey-gooey and loaded with toppings, go elsewhere, although in one popular variation here, a slice of provolone or American is melted on top. Serving pizza was the brainchild of Angelo Zappala, explains Leonora Zappala-Mambro, Angelo’s daughter and Matthew’s aunt (an outsider needs a family tree to keep track of who is related to whom). The Zappalas started making pizza in Lawrence around 1944. But summers were slow, Leonora says, and just as the war was ending, it seemed to make sense to open up near the water during the warmer months, selling pizza from a small stand at Salisbury beach. That’s when it really took off, and Tripoli’s distinctive take on pizza soon became its signature item, hence the name “beach” pizza. The neighborhood has changed a lot since Angelo Zappala first recruited customers by trudging up and down tenement steps selling bread, as his daughter Leonora tells it. But Tripoli has changed very little, which might be the secret of its success. TRIPOLI BAKERY 106 Common St., Lawrence, 978-682-7754; 542 Turnpike St., North Andover, 978-682-0003; 418 State Route 286, Seabrook, N.H., 603-474-7764; Tripoli Pizza Salisbury, 23 Broadway, Salisbury Beach Center, Salisbury, 978-465-3846.